Let it Ride Poker is a favorite variation of Texas Hold’em styled Poker as the game provides the same hand rankings, but with much greater payouts. Many players would also say the game combines the values of video Poker and Casino Poker as players need to achieve at least 10’s or better to qualify for the hand. Any combinations below a pair of 10’s will result in a loss. On the other hand, the thing that makes the game popular is the reward opportunities achievable with this variation of Poker. The lowest payout is 1 to 1 with a pair of 10’s, face cards or Ace’s, but anything higher results in a bigger reward. Some games also provide a progressive jackpot side bet option, which could lead to huge payouts for the combinations created with the cards on the table. Another attractive aspect of Let it Ride Poker is that players have the opportunity to simply call for the next card or raise with a good hand. This combined with the higher payouts means that you can hit some massive winnings. The game lets you rise twice, and if that hand results in a win, both your bet and the 2 raise values will be matched by the payout. The credit of inventing Let It Ride Poker goes to Shuffle Master, a company that wanted to popularize its automatic shuffling machines. Although the BG-1 Shuffler developed by the corporation in the early nineties was an excellent product, casinos did not take much interest in it till the company created a brand new game called Let It Ride Poker. The game became very popular in casinos all over Nevada, and so did Shuffle Master’s BG-1 machine. The company was encouraged to release newer models of its shuffling machines, and in the next five years, the machines were commonly used in Las Vegas casinos. Later, Shuffle Master developed a new variant of Let It Ride Poker, attaching to it an optional side bet of $1 and introducing special payouts for players who got a pair or better. 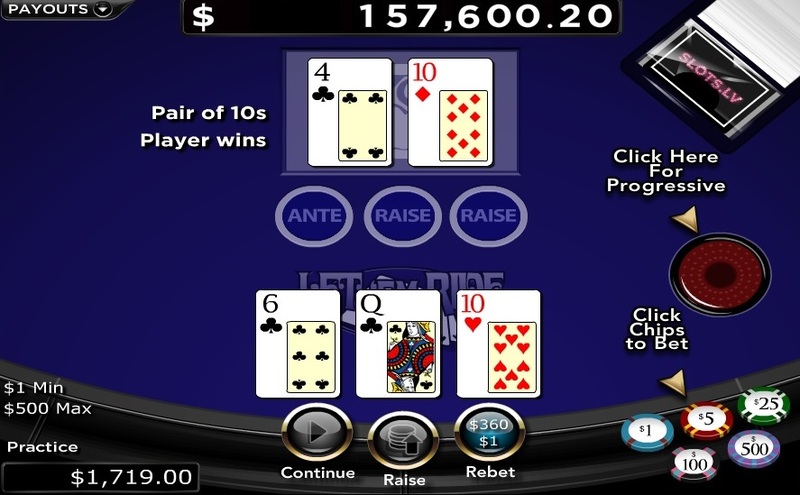 Today, casinos also have a variant of Let It Ride Poker, which offers a progressive jackpot as well. The game is now also available in online casinos, which provides the same rules and many developers offer a progressive jackpot winning. Some developers have also made Let it Ride Poker available with live dealers that feature a real dealer to provide a professional game with various bet options and a fair gaming opportunity. Let It Ride Poker is based on the rules of Five Card Stud, challenging players to create a strong poker hand with two community cards and three cards that are dealt to them. Initially, the community cards are placed face down. It is an interesting variation of Poker as you do not play against any other players or the house. Instead, you need to create poker hands that qualify for a payout otherwise your wager amount would be lost. As mentioned above, at least a pair of 10’s or better will be needed to qualify, which might sound a lot easier than it is. This is why you have the opportunity to raise twice before the community cards are turned over, giving players the opportunity to increase their payouts. However, on those hands that do not hold any reward opportunities, you have the option to continue (Check), which also results in the next community card being shown. With higher hands, you will receive a much higher payout, which is multiplied with each bet you’ve placed. So, having 3 of a kind as you first 3 cards will result in massive winnings as you would raise on both community cards and receive a payout of 2 to 1 per bet. The game provides rather limited options, making it easy to play and understand. To play the game, you would need to have a basic knowledge of Hold’em Poker hand rankings as this will allow you to recognize when it’s worth raising or simply checking when the community cards appear. On the table you will find 3 betting sections in front of you, these include Ante and 2 raise bet options. To start the game, place a bet in Ante, which needs to be within table limits. The dealer will not provide you with 3 face up cards and deal another 2 cards face down. Assess the first 3 cards and to determine whether or not you would like to increase the bet by raising or continue with the Ante bet only to the next round. Once you’ve selected an option, the dealer will turn over the first community card. Once again, you will have the opportunity to assess the cards along with the first community card to see if any worthwhile combinations are presented. If there are, raise, if not, then press continue again. This will then go through to the end of the game where the last community card is turned over, and rewards are granted for any combinations you might have achieved. The last round does not provide a betting option but could result in combination with the last card. There are only 9 possible payouts available in the game as high card hands will result in a loss. Each of these combinations provides payouts of their own, and with most variations of the game, the jackpot is 1,000x your bet value per bet. This means if you placed an Ante bet of $1 and raised on both options, you will receive $1,000 for the Ante bet, and $1,000 for each of the raise bets, making a total win of $3,000 from a $3 bet total. The other winnings are also very impressive and simply become massive with a higher bet. Each of the bets will result in the same payout, meaning any raises will basically double or triple your win. The maximum payout of 1,000x is offered with a Royal Flush (Same suit cards with values 10, J, Q, K, A). The second highest reward will provide 200x per bet, which is granted for a Straight Flush (Same suit cards with any 5 consecutive card values). The third highest payout takes place with 4 of a kind that will pay out 50x per bet (Any 4 cards with the same value). A Flush will feature the fourth-highest payout, which provides 11x your bet value (5 cards holding the same suit). A straight features the fifth highest winning with 8x the wager amount (5 cards with a numerical value, any suit). Three of a kind provides a 3 to 1 reward for each placed bet (3 cards with the same value). Two pair is the second lowest payout and will offer a reward of 2 to 1 (4 cards creating 2 packs of cards with the same value). Finally, the lowest payout is granted for a pair of at least 10’s or higher. This means a pair of 10’s, J’s, Q’s, K’s, or A’s are needed to achieve a reward of 1 to 1. The games that provide a progressive jackpot opportunity usually require a side bet. These side bet requirements range in value from casino to casino, which also depends on the value of the jackpot. Jackpot winnings are usually rewarded for combinations consisting of Straight Flush or Royal Flush, which will provide different percentages. Since the game is so easy to play, there not many tips regarding the value you bet. However, once you’ve played the game, you will see it’s possible for multiple hands to result in a loss in consecutive order, which is why it’s highly recommended to have a bankroll that will cover at least 10 hands or more, excluding the raise values for each hand. Players with a smaller bankroll should start with a lower bet and cover at least 10 hands with optional bets. One of the most important things to remember is not to go on luck with Let It Ride. For example, professionals would say wait until you have a combination before hitting raise even if you have Q, K, A for your first 3 cards as even the small combinations can result in a number of impressive payouts, but guessing could result in losing a lot faster. Since the game provides various options and doesn’t result in a winning with most hands, it’s rather difficult to apply a strategy to the game. However, many have said the the Laboucher system can be implemented, which requires players to use a series of 1’s on a paper and cancel out each hand. For example, start with tens 1’s in a row (1111111111). Your first bet would be the sun between the first and last number, which is 2 (1+1). Should that result in a loss, you will add 2 to the end of your series and not cross out the first 1 (11111111112). Your next bet would once again be the sum of the first and last number, which is 3. If this hand wins, you will cross out both numbers and move to the center. This will ensure you cover your losses and make a profit. However, the issue with a system like this is that you would need a much bigger bankroll and the chances of the accumulation being massive are quite easy. Be sure the table allows bets to accommodate higher bets otherwise, this system will not work.